Featuring Our Exclusive EASY TEAR Perforation System! We provide an easy solution to cut down on Wasted Dog Waste Bags therefore saving you money. 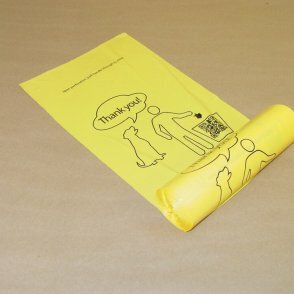 We make Bio-Buddy dog waste station bags made from recycled plastic and bio based resin. This combination creates a biohybrid™ dog waste bag. Since All our products are Made in USA, the quality is great. Since you are Buying Directly From The Manufacturer the price is great. We make all our own bags so we know what is in them. We do not sell imported products. Because our roll bags fit all the major dog waste stations you are able to use your existing dispensers. When you buy Dog Waste Station Bags in Quantity you SAVE! When you buy more you save more. Our standard stock bags come packed in cases of 4,000 bags-20 200-count rolls each. We will always work with you to find the cheapest method of shipping which also saves money. Which makes it easy for you. Dog Walkers love them since they tie off easy and have a convenient handle. Bio-Buddy dog waste station bags are well designed for HOA and Marina use since they help keep the grounds and waters clean. 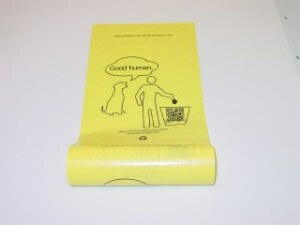 Dog Waste Station Bags printed with an educational message to encourage responsible dog waste pick-up. Brightly colored dog waste bags to encourage responsible disposal in the garbage can-not under the closest bush. Dog waste bags that were NOT biodegradable. “Biodegradable” is seen as invitation to dispose of used dog waste bags improperly. Used Dog Waste Bags thrown under the nearest bush is not good. It is not good for the park workers. It is not good for the environment. Some dog waste bag users think “biodegradable” dog waste bags will just go away. They will not. They will just turn into little pieces of plastic. They will not go away. The US Federal Trade Commission agrees with us. They have issued new Green Guidelines that explain the situation. Local governments have been enforcing the rules. Also be careful of dog waste bags that are marked oxo-biodegradable, oxo-degradable, and degradable. Because they are designed to break up into bits, they all have the same problem. Bio-Buddy dog waste station bags work in all major roll dog waste bag dispensers. No one wants to replace existing dog waste bag dispensers. Why not use what you already have? Because they have a light-hearted, friendly, educational message they encourage dog waste pickup. Since the are brightly colored they are easy spotting by park maintenance workers. Due to NOT being biodegradable they have none of the problems associate with biodegradable dog waste bags. Since a drop-in converter system is available for wicket style/carded bag dispensers, there is no need to replace existing dispensers. Our converter drops right into existing hanging bag dispensers. With the convertor, the dispenser with hold 2 rolls of roll style bags. Provide a DOG WASTE BAG CLOSURE SYSTEM which keeps dog poop off your hands. Are strong and thick for easy use while having no surprising break-through accidents. Have no length of storage concerns. Since there is no storage limit, Bio-Buddy dog waste bags will not become bits of litter during storage. This is a problem which is common with “biodegradable” dog waste bags. Made in the USA. We are not resellers, we are the manufacturer. Therefore you are dealing direct. Click Here To See Our Roll Bag Dispensers! 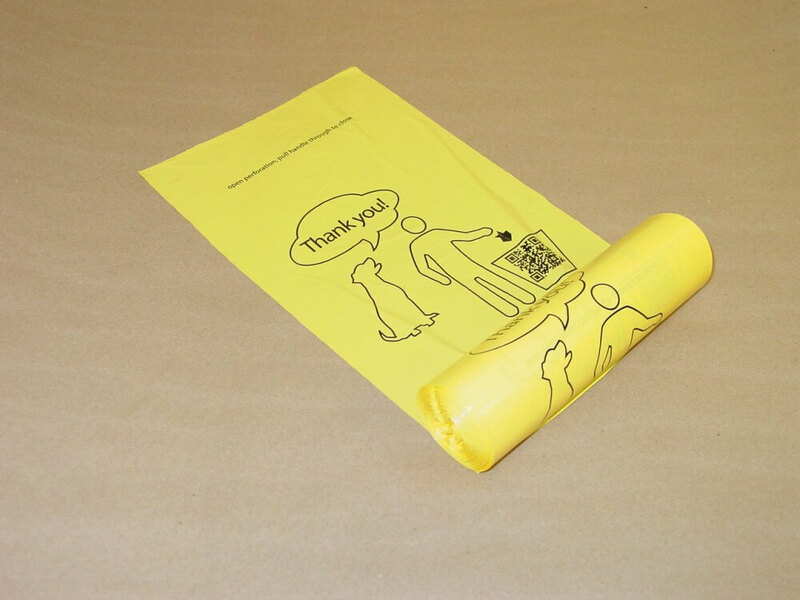 Dog Waste Station Bags can be Custom Printed. Dog waste bags with a Message! Advertise your Business or Product on the bags. Donate the bags to a local dog park. While you get the advertising, they get free bags. It’s another way to stretch tight park budgets and seems to be a win-win situation. Dog Waste Bags Made In The USA!